This text was copied from Wikipedia on 15 January 2019 at 6:00AM. The theorbo is a plucked string instrument of the lute family, with an extended neck and a second pegbox. 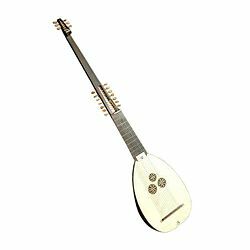 Like a lute, a theorbo has a curved-back sound box (a hollow box) with a wooden top, typically with a sound hole, and a neck extending out from the soundbox. As with the lute, the player plucks or strums the strings with one hand while "fretting" (pressing down) the strings with the other hand; pressing the strings in different places on the neck produces different pitches (notes), thus enabling the performer to play chords, basslines and melodies. It is related to the liuto attiorbato, the French théorbe des pièces, the archlute, the German baroque lute, and the angélique or angelica. A theorbo differs from a regular lute in that the theorbo has a much longer neck which extends beyond the regular fingerboard/neck and a second pegbox at the end of the extended neck. Low-register bass strings are added on the extended neck. This gives a theorbo a much wider range of pitches (notes) than a regular lute. The theorbo was used during the Baroque music era (1600–1750) to play basso continuo accompaniment parts (as part of the basso continuo group, which often included harpsichord, pipe organ and bass instruments), and also as a solo instrument. Theorbos were developed during the late sixteenth century in Italy, inspired by the demand for extended bass range instruments for use in opera developed by the Florentine Camerata and new musical works utilising basso continuo, such as Giulio Caccini's two collections, Le nuove musiche (1602 and 1614). For his 1607 opera L'Orfeo, Claudio Monteverdi lists duoi (two) chitaroni among the instruments required for performing the work. Musicians originally used large bass lutes (c. 80+ cm string length) and a higher re-entrant tuning; but soon created neck extensions with secondary pegboxes to accommodate extra open (i.e. unfretted) longer bass strings, called diapasons or bourdons, for improvements in tonal clarity and an increased range of available notes. Although the words chitarrone and tiorba were both used to describe the instrument, they have different organological and etymological origins; chitarrone being in Italian an augmentation of (and literally meaning large) chitarra – Italian for guitar. The round-backed chitarra was still in use, often referred to as chitarra Italiana to distinguish it from chitarra alla spagnola in its new flat-backed Spanish incarnation. The etymology of tiorba is still obscure; it is hypothesized the origin may be in Slavic or Turkish torba, meaning 'bag' or 'turban'. According to Athanasius Kircher, tiorba was a nickname in Neapolitan language for a grinding board used by perfumers for grinding essences and herbs. It is possible the appearance of this new large instrument (particularly in a crowded ensemble) resulted in jokes and a humour induced reference with popular local knowledge becoming lost over time and place. Robert Spencer has noted the confusion the two names were already leading to in 1600: Chitarone, ò Tiorba che si dica (chitarrone, or theorbo as it is called). By the mid-17th century it would appear that tiorba had taken preference – reflected in modern practice, helping to distinguish the theorbo now from very different instruments like the chitarrone moderno or guitarrón. Similar adaptations to smaller lutes (c. 55+ cm string length) also produced the arciliuto (archlute), liuto attiorbato, and tiorbino, which were differently tuned instruments to accommodate a new repertoire of small ensemble or solo works. In the performance of basso continuo, theorboes were often paired with a small pipe organ. The most prominent early composers and players in Italy were Giovanni Girolamo Kapsperger and Alessandro Piccinini. Giuliano Paratico was another early Italian chitarrone player. Little solo music survives from England, but William Lawes and others used theorbos in chamber ensembles and opera orchestras. In France, theorbos were appreciated and used in orchestral or chamber music until the second half of the 18th century (Nicolas Hotman, Robert de Visée). Court orchestras at Vienna, Bayreuth and Berlin still employed theorbo players after 1750 (Ernst Gottlieb Baron, Francesco Conti). Solo music for the theorbo is notated in tablature, a form of music notation in which the frets and strings which a player must press down are printed on a series of parallel lines which represent the strings on the fretboard. The tuning of large theorboes is characterized by the octave displacement, or "re-entrant tuning", of the two uppermost strings. Piccinini and Michael Praetorius mention the occasional use of metal strings (brass and steel, as opposed to gut strings). The Laute mit Abzügen: oder Testudo Theorbata that appears in Syntagma Musicum by Praetorius, has doubled strings (courses) passing over the bridge and attached to the base of the instrument – different to his Paduanische Theorba (opposite in the same illustration which seems to have single strings). The Lang Romanische Theorba: Chitarron also appears to have single strings attached to the bridge. The string "courses", unlike those of a Renaissance lute or archlute, were often single, although double stringing was also used. Typically, theorboes have 14 courses, though some used 15 or even 19 courses (Kapsberger). This is theorbo tuning in A. Modern theorbo players usually play 14-course (string) instruments (lowest course is G). Some players have used a theorbo tuned a whole step lower in G. Most of the solo repertoire is in the A tuning. The Italians Kapsberger, Castaldi, Piccinini, Viviani, Melli, Pittoni and Bartolotti, and French Robert de Visée, Hurel and de Moyne. The "re-entrant tuning" created new possibilities for voice leading and inspired a new right hand technique with just thumb, index and middle fingers to arpeggiate chords, which Piccinini likened to the sound of a harp. The bass tessitura (range) and re-entrant stringing mean that in order to keep the figured bass "realisation" (the improvised playing of chords) above the bass instruments when accompanying basso continuo, the bassline must sometimes be played an octave lower (Kapsberger). In the French treatises, chords in which a lower note sounds after the bass were also used when the bass goes high. The English theorbo had just the first string at the lower octave (Thomas Mace). Notable composers for theorbo include Alessandro Piccinini, Bellerofonte Castaldi, Johann Kapsberger, Robert de Visee, Roman Turovsky and Bruno Helstroffer. Notable living theorbists include Eduardo Egüez, Michael Fields, Jakob Lindberg, Rolf Lislevand, Robert MacKillop, Andreas Martin, Nigel North, Paul O'Dette, Christina Pluhar, Lynda Sayce, Stephen Stubbs, and Massimo Marchese, among others. Diego Cantalupi, "La tiorba ed il suo uso in Italia come strumento per il basso continuo", pre-press version of the dissertation discussed in 1996 at the Faculty of Musicology, University of Pavia. Davide Rebuffa, Il liuto, L'Epos, Pelermo 2012. Robert Spencer, 'Chitarrone, Theorbo and Archlute', Early Music, Vol. 4 No. 4 (October 1976), 408–422, available at David van Edward's homepage. Wikimedia Commons has media related to Theorbos. Whose neck and throat are deeper than the belly. Some more information about the theorbo and a picture. A Catalogue of Theorbos which he makes. Part of his extensive Lute site. Last Friday night I had the rare opportunity to hear a theorbo in concert performance. It was one of four instruments accompanying the Santa Fe Desert Chorale in the Monteverdi Vespers of 1610. The theorbist was John Lenti, a student of Nigel North.